Yokohama (横浜市, Yokohama-shi) ( listen ), officially the City of Yokohama, is the second largest city in Japan by population after Tokyo, and most populous municipality of Japan. It is the capital city of Kanagawa Prefecture. 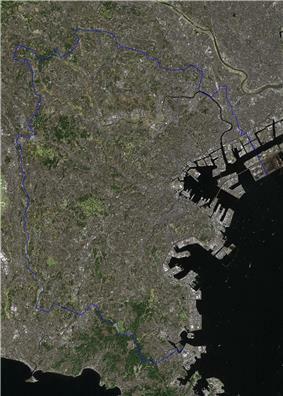 It lies on Tokyo Bay, south of Tokyo, in the Kantō region of the main island of Honshu. It is a major commercial hub of the Greater Tokyo Area. Yokohama's population of 3.7 million makes it Japan's largest incorporated city. Yokohama developed rapidly as Japan's prominent port city following the end of Japan's relative isolation in the mid-19th century, and is today one of its major ports along with Kobe, Osaka, Nagoya, Hakata, Tokyo, and Chiba. Yokohama was a small fishing village up to the end of the feudal Edo period, when Japan held a policy of national seclusion, having little contact with foreigners. A major turning point in Japanese history happened in 1853–54, when Commodore Matthew Perry arrived just south of Yokohama with a fleet of American warships, demanding that Japan open several ports for commerce, and the Tokugawa shogunate agreed by signing the Treaty of Peace and Amity. Yokohama quickly became the base of foreign trade in Japan. Foreigners initially occupied the low-lying district of the city called Kannai, residential districts later expanding as the settlement grew to incorporate much of the elevated Yamate district overlooking the city, commonly referred to by English speaking residents as The Bluff. Kannai, the foreign trade and commercial district (literally, inside the barrier), was surrounded by a moat, foreign residents enjoying extraterritorial status both within and outside the compound. Interactions with the local population, particularly young samurai, outside the settlement inevitably caused problems; the Namamugi Incident, one of the events that preceded the downfall of the shogunate, took place in what is now Tsurumi Ward in 1862, and prompted the brief Anglo-Japanese War of 1863. 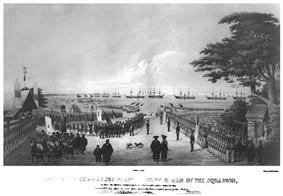 To protect British commercial and diplomatic interests in Yokohama a military garrison was established in 1862. With the growth in trade increasing numbers of Chinese also came to settle in the city. Yokohama was the scene of many notable firsts for Japan including the growing acceptance of western fashion, photography by pioneers such as Felice Beato, Japan's first English language newspaper, the Japan Herald published in 1861 and in 1865 the first ice cream and beer to be produced in Japan. Recreational sports introduced to Japan by foreign residents in Yokohama included European style horse racing in 1862, rugby union in 1866 and cricket in 1868. A great fire destroyed much of the foreign settlement on November 26, 1866 and smallpox was a recurrent public health hazard, but the city continued to grow rapidly attracting both foreigners and local Japanese. After the Meiji Restoration of 1868, the port was developed for trading silk, the main trading partner being Great Britain. Western influence and technological transfer contributed to the establishment of Japan's first daily newspaper (1870), first gas-powered street lamps (1872) and Japan's first railway constructed in the same year to connect Yokohama to Shinagawa and Shinbashi in Tokyo. In 1872 Jules Verne portrayed Yokohama, which he had never visited, in an episode of his widely read Around the World in Eighty Days, capturing the atmosphere of the fast-developing, internationally oriented Japanese city. In 1887, a British merchant, Samuel Cocking, built the city's first power plant. At first for his own use, this coal-burning plant became the basis for the Yokohama Cooperative Electric Light Company. The city was officially incorporated on April 1, 1889. 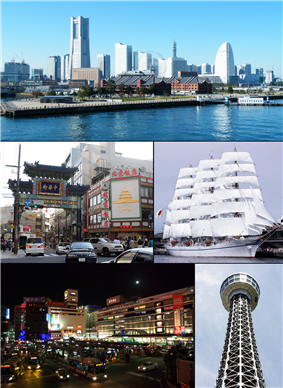 By the time the extraterritoriality of foreigner areas was abolished in 1899, Yokohama was the most international city in Japan, with foreigner areas stretching from Kannai to the Bluff area and the large Yokohama Chinatown. The early 20th century was marked by rapid growth of industry. Entrepreneurs built factories along reclaimed land to the north of the city toward Kawasaki, which eventually grew to be the Keihin Industrial Area. The growth of Japanese industry brought affluence, and many wealthy trading families constructed sprawling residences there, while the rapid influx of population from Japan and Korea also led to the formation of Kojiki-Yato, then the largest slum in Japan. Much of Yokohama was destroyed on September 1, 1923 by the Great Kantō earthquake. The Yokohama police reported casualties at 30,771 dead and 47,908 injured, out of a pre-earthquake population of 434,170. Fuelled by rumours of rebellion and sabotage, vigilante mobs thereupon murdered many Koreans in the Kojiki-yato slum. Many people believed that Koreans used black magic to cause the earthquake. Martial law was in place until November 19. Rubble from the quake was used to reclaim land for parks, the most famous being the Yamashita Park on the waterfront which opened in 1930. Yokohama was rebuilt, only to be destroyed again by thirty-odd U.S. air raids during World War II. An estimated seven or eight thousand people were killed in a single morning on May 29, 1945 in what is now known as the Great Yokohama Air Raid, when B-29s firebombed the city and in just one hour and nine minutes reduced 42% of it to rubble. During the Korean War, the United States Navy used Yokohama's port as a transshipment base. 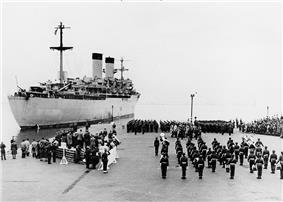 This ship departed Yokohama in 1951, carrying war dead home to the U.S.
During the American occupation, Yokohama was a major transshipment base for American supplies and personnel, especially during the Korean War. After the occupation, most local U.S. naval activity moved from Yokohama to an American base in nearby Yokosuka. The city was designated by government ordinance on September 1, 1956. The city's tram and trolleybus system was abolished in 1972, the same year as the opening of the first line of Yokohama Municipal Subway. Construction of Minato Mirai 21 ("Port Future 21"), a major urban development project on reclaimed land, started in 1983. Minato Mirai 21 hosted the Yokohama Exotic Showcase in 1989, which saw the first public operation of maglev trains in Japan and the opening of Cosmo Clock 21, then the tallest Ferris wheel in the world. The 860m-long Yokohama Bay Bridge opened in the same year. 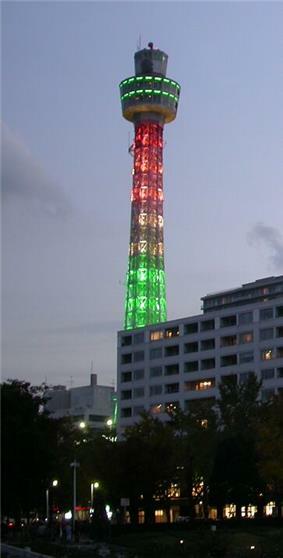 In 1993, Minato Mirai saw the opening of the Yokohama Landmark Tower, the second tallest building in Japan. The 2002 FIFA World Cup final was held in June at the International Stadium Yokohama. In 2009, the city marked the 150th anniversary of the opening of the port and the 120th anniversary of the commencement of the City Administration. An early part in the commemoration project incorporated the Fourth Tokyo International Conference on African Development (TICAD IV) which was held in Yokohama in May 2008. In November 2010, Yokohama hosted the Asia-Pacific Economic Cooperation (APEC) meeting. Yokohama's foreign population of nearly 78,000 includes Chinese, Koreans, Filipinos, and Brazilians. 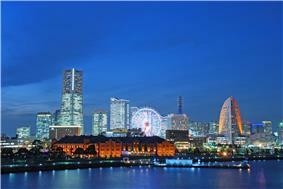 Yokohama features a humid subtropical climate (Köppen: Cfa) with hot and humid summers and chilly winters. Winter temperatures rarely drop below freezing, while summer can get quite warm due to humidity effects. The coldest temperature was on 24 January 1927 when −8.2 °C (17.2 °F) was reached, whilst the hottest day was 11 August 2013 at 37.4 °C (99.3 °F). The highest monthly rainfall has been in October 2004 with 761.5 millimetres (30.0 in), closely followed by July 1941 with 753.4 millimetres (29.66 in), whilst December and January have recorded no measurable precipitation three times each. 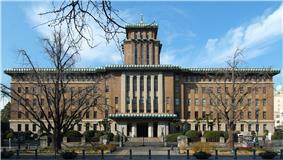 The Yokohama Municipal Assembly consists of 92 members elected from 18 Wards total. The LDP has minority control with 30 seats with Democratic Party of Japan with a close 29. The mayor is Fumiko Hayashi, who succeeded Hiroshi Nakada in September 2009. The city has a strong economic base, especially in the shipping, biotechnology, and semiconductor industries. Nissan moved its headquarters to Yokohama from Chūō, Tokyo in 2010. Yokohama is the world's 31st largest seaport in terms of total cargo volume, at 121,326 freight tons as of 2011, and is ranked 37th in terms of TEUs (Twenty-foot equivalent units). In 2013 APM Terminals Yokohama facility was recognised as the most productive container terminal in the world averaging 163 crane moves per hour, per ship between the vessel's arrival and departure at the berth. Yokohama is serviced by the Tōkaidō Shinkansen, a high-speed rail line with a stop at Shin-Yokohama Station. 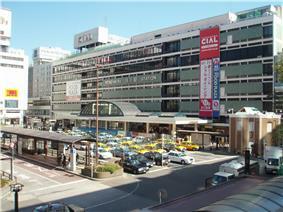 Yokohama Station is also a major station, with two million passengers daily. The Yokohama Municipal Subway provides metro services. Public elementary and middle schools are operated by the city of Yokohama. 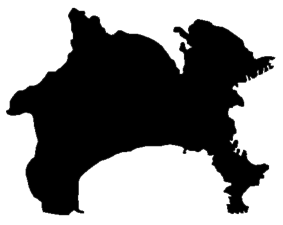 There are nine public high schools which are operated by the Yokohama City Board of Education, and a number of public high schools which are operated by the Kanagawa Prefectural Board of Education. Yokohama National University is a leading university in Yokohama which is also one of the highest ranking national universities in Japan. The historic downtown port district, location of the first foreign settlement, is known as Kannai. Next to the waterfront Yamashita Park is the museum ship, Hikawa Maru, and the Yokohama Marine Tower, the tallest inland lighthouse in the world. 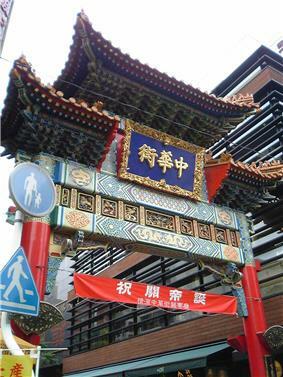 Further inland lies Yokohama Chinatown, the largest Chinatown in Japan and one of the largest in the world. Nearby is Yokohama Stadium, the Yokohama Silk Museum, and the Yokohama Doll Museum. The Isezakichō and Noge areas offer many colourful shops and bars that, with their restaurants and stores catering to residents from China, Thailand, South Korea, and other countries, have an increasingly international flavour. The small but fashionable Motomachi shopping area leads up to Yamate, or "The Bluff" as it used to be known, a 19th/early 20th century Westerners' settlement overlooking the harbour, scattered with foreigners' mansions. A foreigners' cemetery and the Harbour View Park (港の見える丘公園, Minato no mieru oka kōen) is in the area. Within the park are a rose garden and the Kanagawa Museum of Modern Literature. There are various points of interest in the futuristic Minato Mirai 21 harbourside redevelopment. The highlights are the Landmark Tower which was the tallest building in Japan (until surpassed in 2014 by the Abeno Harukas building in Osaka), Queen's Square Yokohama (a shopping mall) and the Cosmo Clock 21, which was the tallest Ferris wheel in the world when it was built in 1989 and which also doubles as "the world's biggest clock". The Shin-Yokohama district, where the Shinkansen station is located, is some distance away from the harbour area, and features the 17,000 capacity Yokohama Arena, the Shin-Yokohama Raumen Museum and Nissan Stadium, known as the International Stadium Yokohama when it was the setting for the final for the 2002 FIFA World Cup. The city is home to the Central League baseball team, the Yokohama BayStars, and the soccer teams, Yokohama F. Marinos and Yokohama F.C. Sankei-en is a traditional Japanese-style garden in Naka Ward. Designed by businessman Tomitaro Hara, it contains seventeen old buildings brought from all over Japan, ten of which have been declared Important National Cultural Properties. Among the attractions are festivals and events. Yokohama has sister-city relationships with eleven cities worldwide. Yukio Mishima's novel The Sailor Who Fell from Grace with the Sea is set mainly in Yokohama. 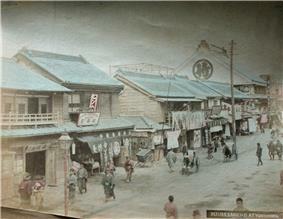 Mishima describes the city's port and its houses, and the Western influences that shaped them. From up on Poppy Hill is a 2011 Studio Ghibli animated drama film directed by Gorō Miyazaki set in the Yamate district of Yokohama. The film is based on the serialized Japanese comic book of the same name. The main setting of James Clavell's book Gai-Jin is in historical Yokohama. Some of the events of Hitoshi Ashinano's manga Yokohama Kaidashi Kikō are unfolding in Yokohama and it's surrounding areas. Aya Fuse lives in the futuristic Yokohama in Scott Westerfeld's novel "Extras". Anne McCaffrey's Dragonriders of Pern book series involves a spaceship named the Yokohama. One of the Pretty Cure crossover movies takes place in Yokohama. In the fourth movie of the series, Pretty Cure All Stars New Stage: Friends of the Future, the Pretty Cure appear standing on top of the Cosmo Clock 21 in Minato Mirai. The main setting of the Japanese visual novel series Muv-Luv, first a school and then, in an alternate history, a military base is built in Yokohama with the objective of carrying out the Alternative IV Plan meant to save humanity. In Command and Conquer: Red Alert 3, Yokohama is under siege by Soviet Union and Allied Nations to stop the Empire of The Rising Sun. The Player must defend Yokohama and then lead a counterattack as the Empire. Main port used in Japan in Jules Verne's Around the World in Eighty Days. 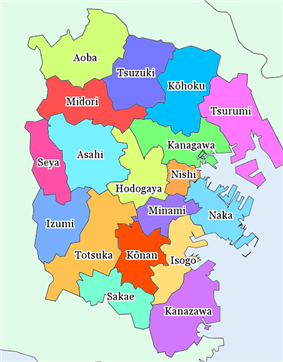 ^ Tokyo is no longer a single incorporated city and suburb. See Tokyo for more information on the definition and makeup of Tokyo. ^ Arita, Erika, "Happy Birthday Yokohama! ", The Japan Times, May 24, 2009, p. 7. ^ Fukue, Natsuko, "Chinese immigrants played vital role", Japan Times, May 28, 2009, p. 3. ^ Matsutani, Minoru, "Yokohama – city on the cutting edge", Japan Times, May 29, 2009, p. 3. ^ Osaka was once more populous than Yokohama is today. Hammer, Joshua (2006). Yokohama Burning: The Deadly 1923 Earthquake and Fire that Helped Forge the Path to World War II. New York: Simon & Schuster. ISBN 978-0-7432-6465-5 (cloth). Heilbrun, Jacob. "Aftershocks". The New York Times, September 17, 2006. "At the Future Port", by Vinod Jacob (a travel report). The Hindu Business Line, July 6, 2007.